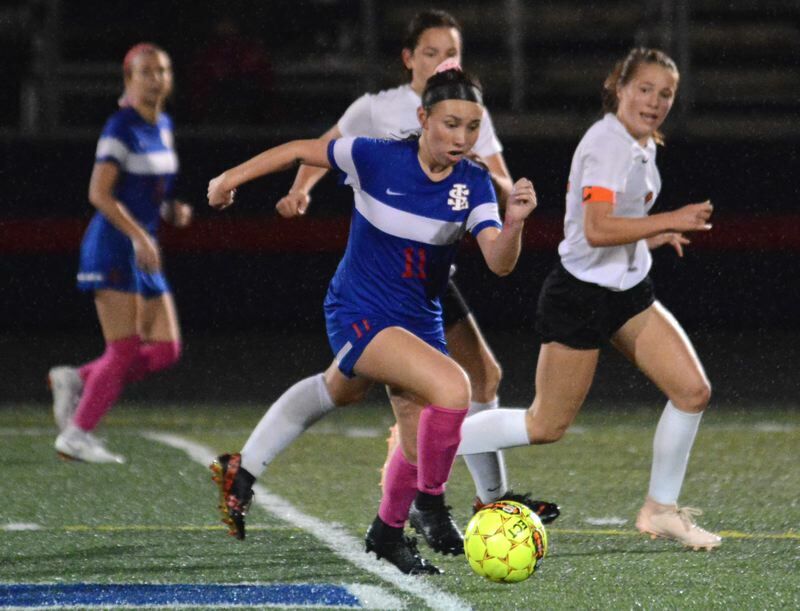 The La Salle Prep girls soccer team secured a spot into the 5A playoffs after earning a 1-1 draw with top-10 Scappoose in last Thursday's league finale. The Falcons put the game's first goal onto the scoreboard when Maddie Khaw went to the far post in the 49th minute. Scappoose answered barely a minute later when Rylee Cook drew a foul 20 yards out near the sideline. Lauren Whisenhunt sent a high free kick into a crowd at the far post where teammate Emma Jones was able to get a foot on it to deflect the equalizer into the net. Scappoose sent several waves of attacks at the net, highlighted with four minutes left when Grace Negelspach got loose down the middle before tapping a pass to her right where Tessa Davidson launched a shot over the top from 15 yards out. "There was a lot of pressure, but we just had to keep it tight in the back and rely on the basic principles that we've practiced all season," La Salle senior captain Audrey Schelb said. The Falcons would get the final chance for the win after Khaw attempted a give-and-go run with Nebels in the attacking third only to have Scappoose defender Shayna Redpath slide down low to cut off the pass back. The teams finished the season tied for second place in the Northwest Oregon Conference — each qualifying for the playoffs. La Salle Prep (7-5-2) plays at No. 4-ranked Churchill at 6:30 p.m. on Halloween night. Look for expanded coverage ahead in our Oct. 31, print edition.